Online vendors need to define the conditions in which they will accept returns from customers and refund payments. Online shoppers are more likely to purchase when they have the ability to return items. Some shoppers will review a merchant's returns policy before purchasing, and a fair returns policy increases the likelihood of a sale. Having a clear returns policy builds trust with potential customers. A returns policy can also provide a vendor with some protection against unreasonable returns by allowing the vendor to set guidelines and give the vendor a basis to refuse to issue refunds for returns that do not meet these guidelines. 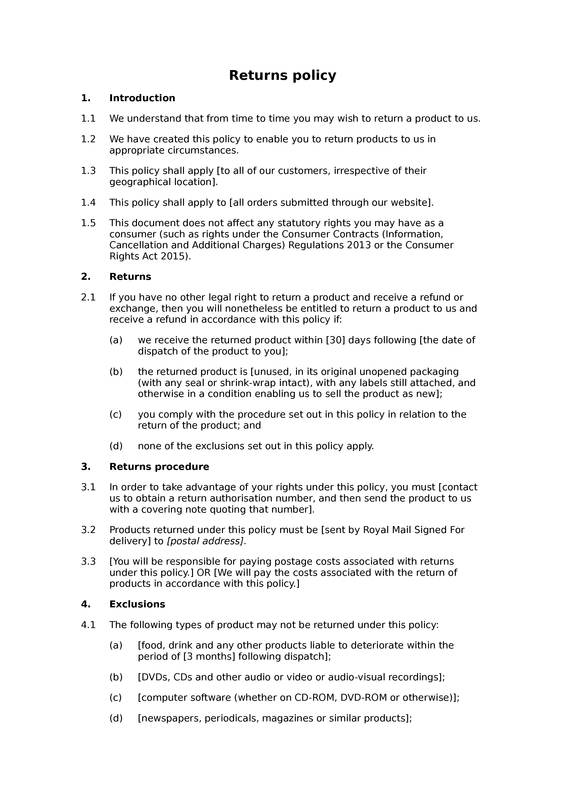 The approach in this model returns policy allows you to define a return period and to specify what customers must do in order to qualify for a refund. These requirements may include an obligation to obtain pre-authorisation or to use specified shipping methods. The provisions on returns may also exclude the return of defined types of products (eg personalised or perishable products). Under distance selling regulations, consumers typically have the right to cancel their contract and return merchandise within a specified period. 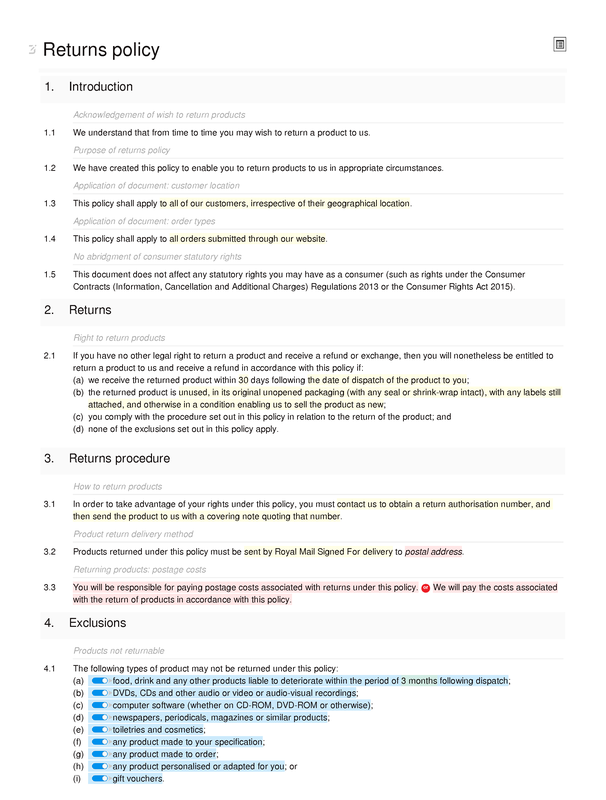 These regulations also make the seller responsible for the cost of return shipping unless the seller clearly specifies that the consumer must pay for shipping the products back. Our returns policy model takes account of these regulations (although the main distance selling provisions are set out in our terms and conditions of sale templates). With a returns policy based on our model, you should be able to reassure potential customers about their online shopping experience, to better manage the returns process and more easily justify denying refunds for returns that do not comply with the policy.